3 Right Ways to Take Care of Sensitive Baby Skin - Babies are born with skin that is more sensitive than adults. That is why newborns need more painstaking skincare so that they are not easily irritated and inflamed. So, how do you treat sensitive baby skin? Why is baby's skin sensitive? For 9 months in the womb, the baby is protected by a layer of fatty substances called vernix which is attached to the entire skin. This layer acts as a blanket to maintain the baby's body temperature while keeping his skin moist and not wrinkled even though submerged in amniotic water. Now when babies are born into the world, changes in extreme environmental temperatures from damp (the environment in the womb) to very dry (outside air) can make baby's skin dry out quickly. "Compared to adult skin, baby's skin is much thinner and tends to be more sensitive to changes that occur around it," said Dr. Srie Prihianti Sp.KK, a pediatric skin specialist (child dermatology) who was met by the Hello Sehat team in the Mega Kuningan area on Monday (5/11). The structure of the newborn's skin tissue is also still loose so that any foreign particles in the surrounding air can enter easily and irritate the skin. In addition, the baby's skin protection system has not yet been formed perfectly to fight the foreign substances that enter. Dry and sensitive baby's skin makes it very vulnerable to skin disorders such as eczema and itchy rash. Using the wrong baby skin care products can also aggravate skin problems if you are not careful. This is a high risk because it causes itching, redness, skin irritation, and even dry scaly to peel off. Before knowing the tips for newborn skin care, you have to know first what is the purpose of caring for sensitive baby skin, said Dr. Srie Prihianti Sp.KK. Maintain moisture in baby's skin. Choose newborn skin care products that contain organic ingredients. In addition, choose products that are labeled hypoallergenic to prevent the risk of allergies. Also, try to choose soap and shampoo products that have a balanced pH with " low ocular irritation index " (labeled "pH-balanced"). Do not also choose soap which afterward makes the skin tight, said Dr. Srie. Soap that makes the skin tight is the sign of drying the skin. Choose baby soap which actually feels slippery even after drying, because this is a sign that the soap contains a lot of moisturizers. When a newborn, it's good not to be bathed immediately. Generally, many mothers are uncomfortable seeing the fat membrane attached to the baby's body shortly after birth. Though the fat membrane that has the name vernix caseosa serves to moisturize and protect the skin from infection and the risk of allergies. Many neonatal health experts advise parents to postpone the baby's first bathing time until the vital signs and temperature of the baby are stabilized, about 2-4 hours after birth. Also, pay attention to the way. Bathing the baby must be with lukewarm water (36-47º Celsius) by soaking his entire body in the tub. Do not bathe the baby for too long, at least 10-15 minutes. The duration of bathing can reduce the baby's body temperature and trigger hypothermia. Not only do adults need to be moisturized with moisturizers, they also need newborns. Especially because baby's skin tends to be dry and very sensitive. A good moisturizer can help maintain moisture in the skin immediately after taking a shower. 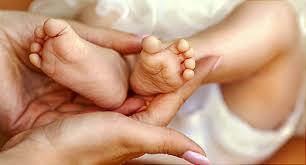 Moisturizers also function to improve the baby's skin texture to make it softer and flexible. Apply moisturizer 2-3 minutes after bathing when the skin is still slightly damp, washed with water. This trick will more effectively moisturize the skin than applying moisturizer when the baby's skin is completely dry. If your baby's skin is not sensitive or normal, choose lotion type moisturizer. If dry skin is sensitive, choose the type of cream. Is it safe for metal jewelry for baby skin? It is not a strange phenomenon to see a newborn baby already wreathed in jewelry. Awarding jewelry for babies whether, in the form of gold necklaces, bracelets, earrings, or anklets is indeed a tradition down in Indonesia. However, is it really safe for your baby to wear jewelry? Because some types of metals are known to trigger allergic reactions and itchy rashes in adults. "Compared to adult skin, baby's skin is thinner and tends to be more sensitive to changes that occur around it," said Dr. Srie Prihianti Sp.KK, Ph.D., a pediatric skin specialist from PERDOSKI who is also the chairman of the Indonesian Child Dermatology Study Group (KSDAI). When met by the Hello Sehat team in the Mega Kuningan area on Monday (5/11), Dr. Yanti, as she is known, explained that babies with sensitive skin are very susceptible to skin disorders such as itchy red rashes, allergies, and irritation. Especially if the baby also has a history of eczema ( dermatitis ) in his family. Is it safe to wear jewelry for babies? Wearing jewelry for actual babies is okay. However, you must pay close attention to the jewelry material you choose. The wrong type of metal can trigger problems in the baby's skin which is already sensitive if you are not careful. We recommend that you choose jewelry for babies made from pure gold rather than silver, platinum, and iron-containing nickel jewelry. Silver, iron, and nickel are the types of metals that are most at risk of causing allergic reactions. This metal allergic reaction is known as eczema or contact dermatitis. Allergic contact dermatitis will get worse when the skin sweats. "Gold is very rare to cause allergic contact dermatitis because it is inert ( stable and not reactive). "Gold jewelry will not react with the skin," explained Dr. Yanti. For the same reason, you should also avoid baby jewelry made from synthetic fibers and plastic. Itching and red spots on the skin are the initial symptoms that the skin has an allergy to the jewelry attached to the body. Apart from the type of metal, also consider the shape and model of jewelry for babies. Babies like to pull objects around them and put everything in their mouths. Necklaces and bracelets with thin chains can easily break when pulled so that the beads can make the baby choke if swallowed. Sharp or rough edges of the jewelry can also scratch and irritate the baby's skin. So, choose simple jewelry that does not have beads or decorated with pendants. For bracelets and anklets, you also need to make sure that the size is right with the circumference of the baby's leg. Not too tight and too loose. It is better not to let the baby wear any necklace around the neck until they are much older.